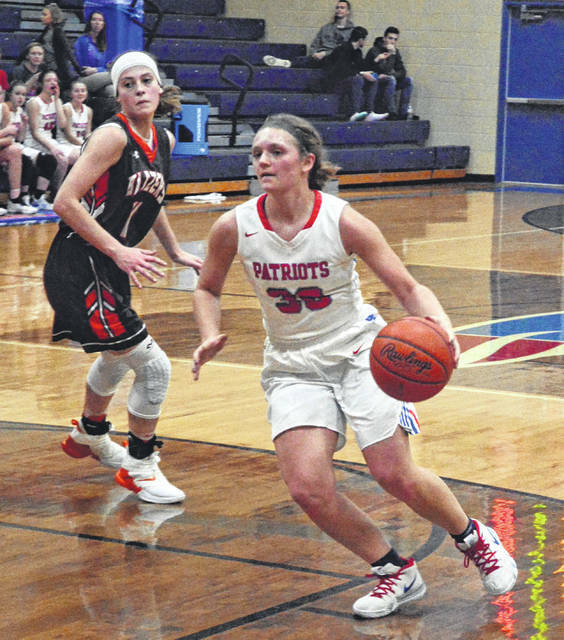 Tri-Village point guard Andi Bietry brings the ball up court during a game with Cross County Conference foe National Trail on Thursday. The Patriots won the game, 54-13. 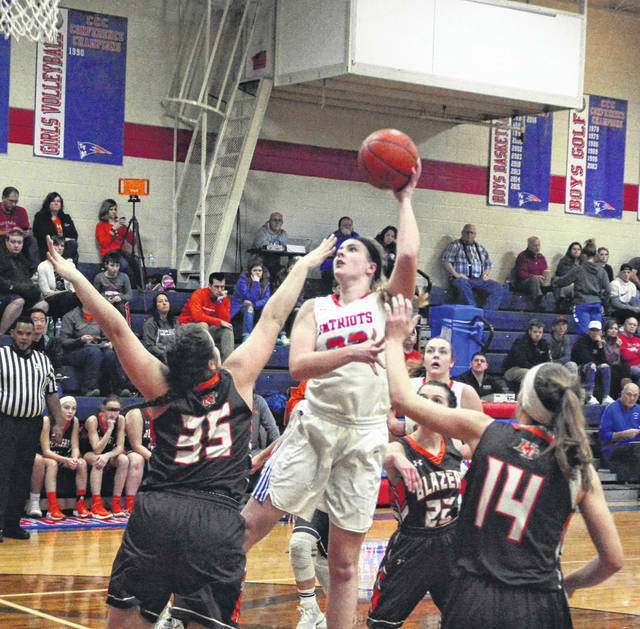 Tri-Village junior Lissa Siler drives toward the basket for the score during a game with Cross County Conference foe National Trail on Thursday. The Patriots won the game, 54-13. 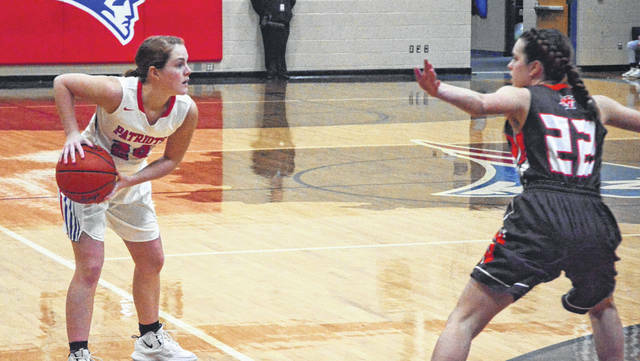 Tri-Village senior Emma Printz brings the ball up court during a game with Cross County Conference foe National Trail on Thursday. The Patriots won the game, 54-13. Tri-Village junior Maddie Downing attempts a left-handed hook shot during a game with Cross County Conference foe National Trail on Thursday. The Patriots won the game, 54-13. 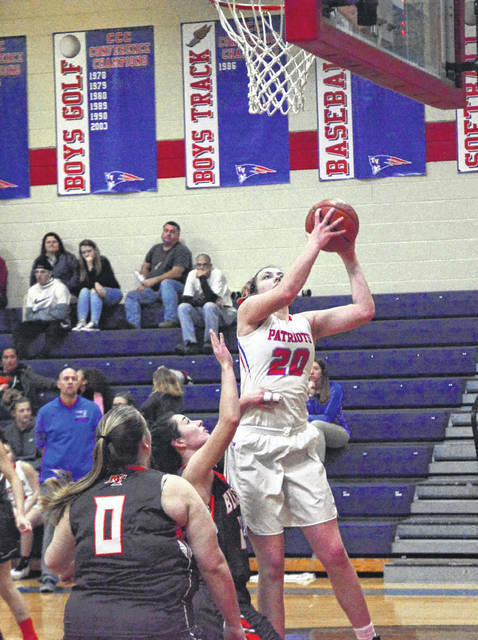 Tri-Village freshman Meghan Downing goes up strong to the basket during a game with Cross County Conference foe National Trail on Thursday. The Patriots won the game, 54-13. 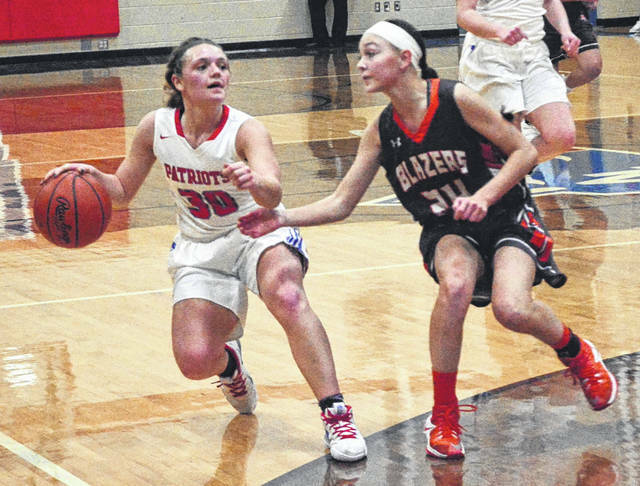 Tri-Village point guard Andi Bietry looks for an opening to pass the ball during a game with Cross County Conference foe National Trail on Thursday. The Patriots won the game, 54-13. Tri-Village senior Emma Printz takes a shot from underneath during a game with Cross County Conference foe National Trail on Thursday. The Patriots won the game, 54-13. 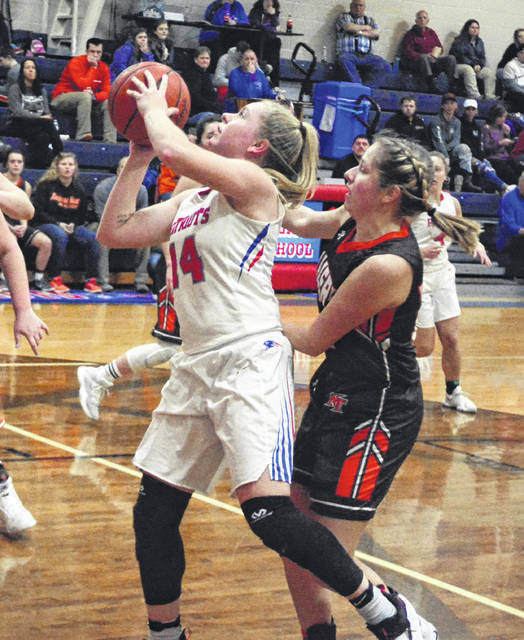 Tri-Village junior Lissa Siler looks for a way to cut to the basket during a game with Cross County Conference foe National Trail on Thursday. The Patriots won the game, 54-13. 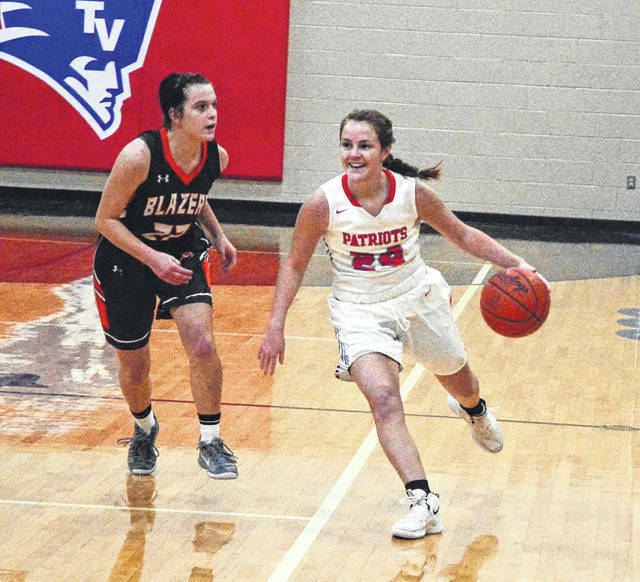 NEW MADISON – The Tri-Village Patriots were firing on all 8 cylinders for their game against fellow Cross County Conference team National Trail. Tri-Village could do nothing wrong and for visiting Trail – nothing went right. The Patriots dominated on both sides of the ball as their offense scored pretty much at will and the defense overwhelmed Trail for a lopsided 54-13 win. The Patriots put a lid on the basket for this game. Defensively, the Patriots used both a zone and a man-to-man defense at different points in the game. They did not need to resort to the press. Trail has been averaging 39 points per game this season, but in this game the Blazers did not reach double figures until late in the fourth quarter. Makena Laird has been National Trail’s leading scorer and she was held to just 5 points. so it was an impressive defensive performance for Tri-Village. On offense, the Patriots scored both inside and outside. Post players Meghan and Maddie Downing both scored inside and showed range by connecting away from the basket as well with some 12-15 foot shots. The wings tickled the nets with 3-pointers and when Trail put pressure on the perimeter, they slashed to the basket for layups. Trail was totally frustrated as the Patriots had too many offensive weapons for them to stop. Patriot Coach Brad Gray on the game, “I am impressed with our defense, but more than that our overall energy level. We have been in a funk lately even though we have been winning some games. I wasn’t sure that we have been who we are – but tonight I felt like we got that back. We played with passion and we had fun on the floor. Because of the energy it translated into shots made on the floor and defending with integrity. It was good to see that back tonight. The Patriots have three league games up in the next few weeks. They will play North, South and a big game against Miami East, who is in second place. The team will need to figure out how to stop Morgan Haney, who is among league leaders in scoring and assists. 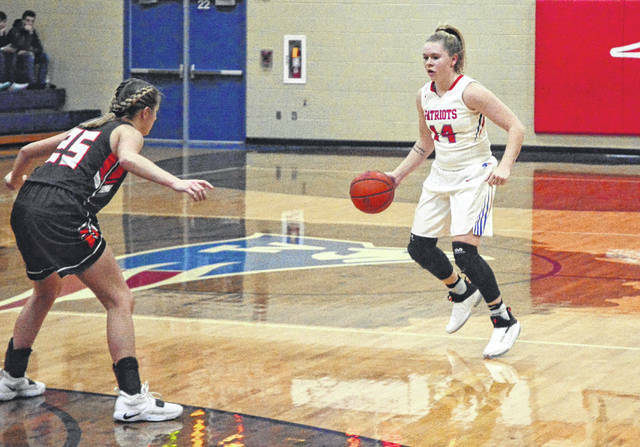 The Patriots had three players in double figures led by Siler with 15, Meghan Downing with 13 and Emma Printz with 10. Also scoring for the Patriots were Maddie Downing 8, Molly Scantland 3, Andi Bietry 3 and Madison Foreman 2.